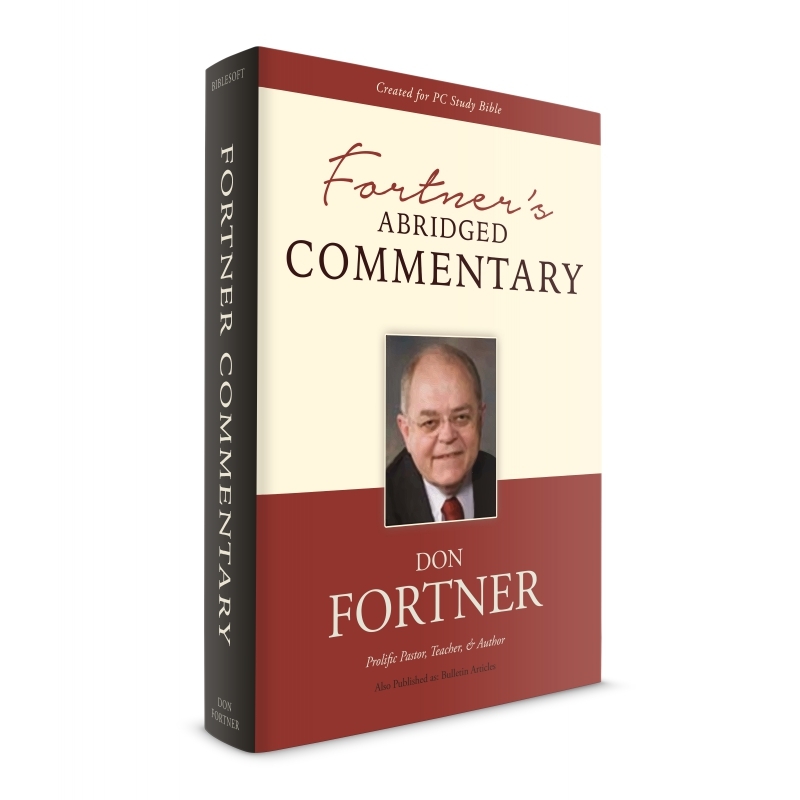 By Don Fortner. 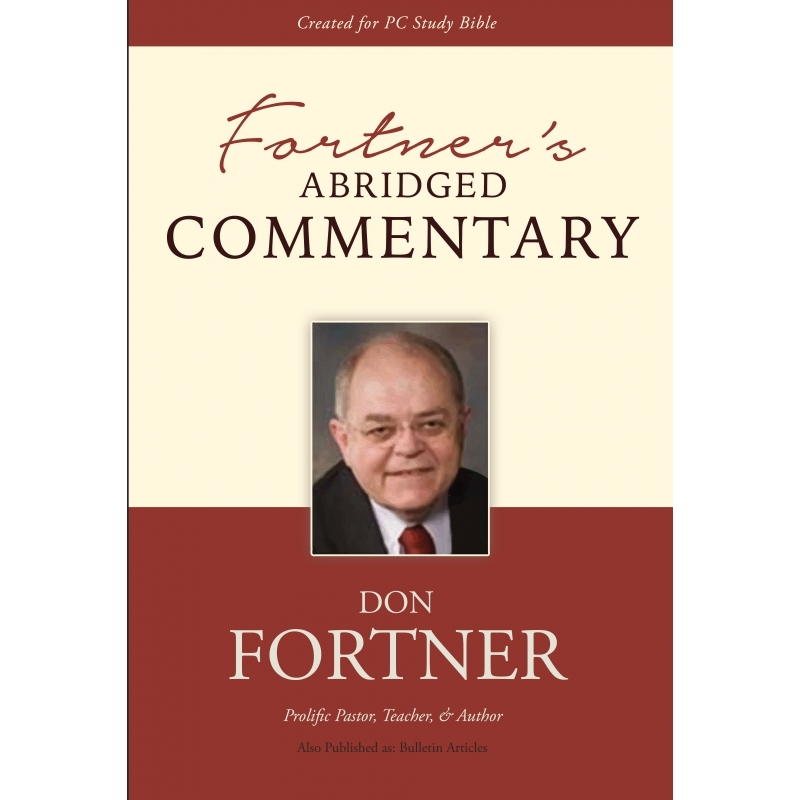 Includes commentary for every book of the Bible with especially thorough coverage of several New Testament books. Don Fortner has pastored for decades at Grace Baptist Church. He has preached at conferences and churches around the country and around the world. 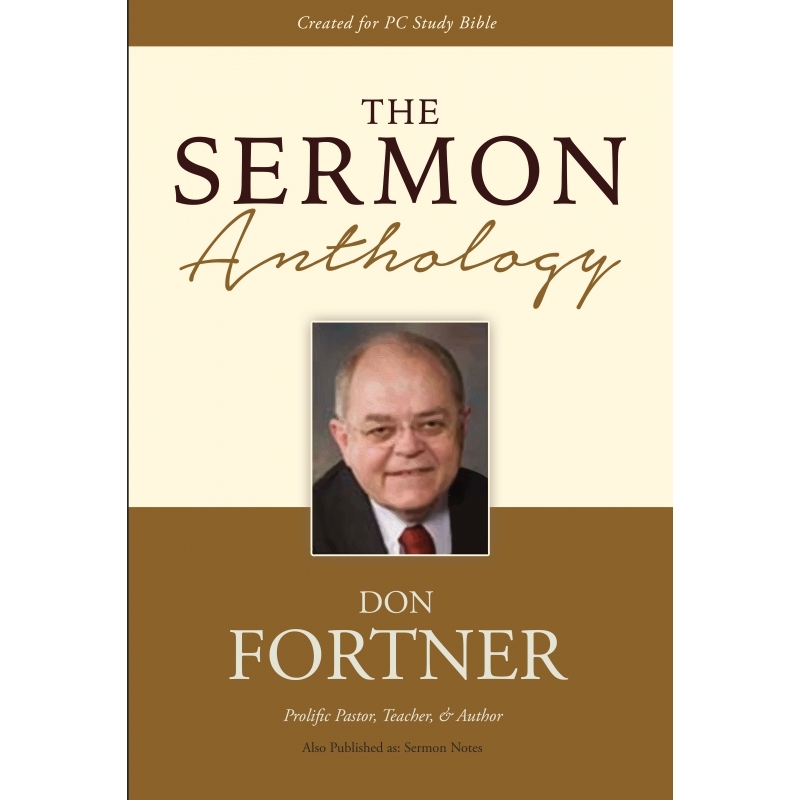 Biblesoft has compiled an extensive collection of this seasoned pastor's sermons into one gigantic reference work for PC Study Bible. Learn more about these titles below. The Sermon Anthology must rank among one of Fortner's most impressive works to date, compiling 2,827 sermons - spanning years of ministry. The text alone in this work weighs in at over 70 megabytes! 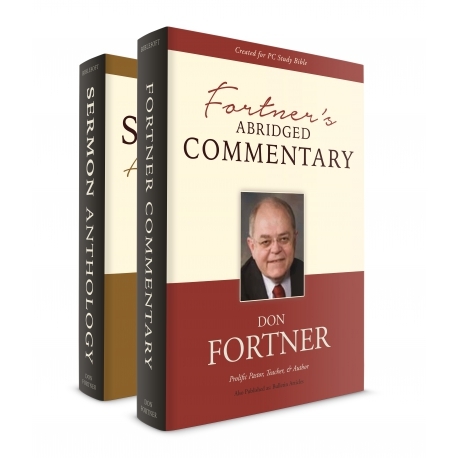 If you are a student of the Bible you will also benefit from this work. The sermon notes are very easy-to-read and are sure to grow your understanding of the Bible. 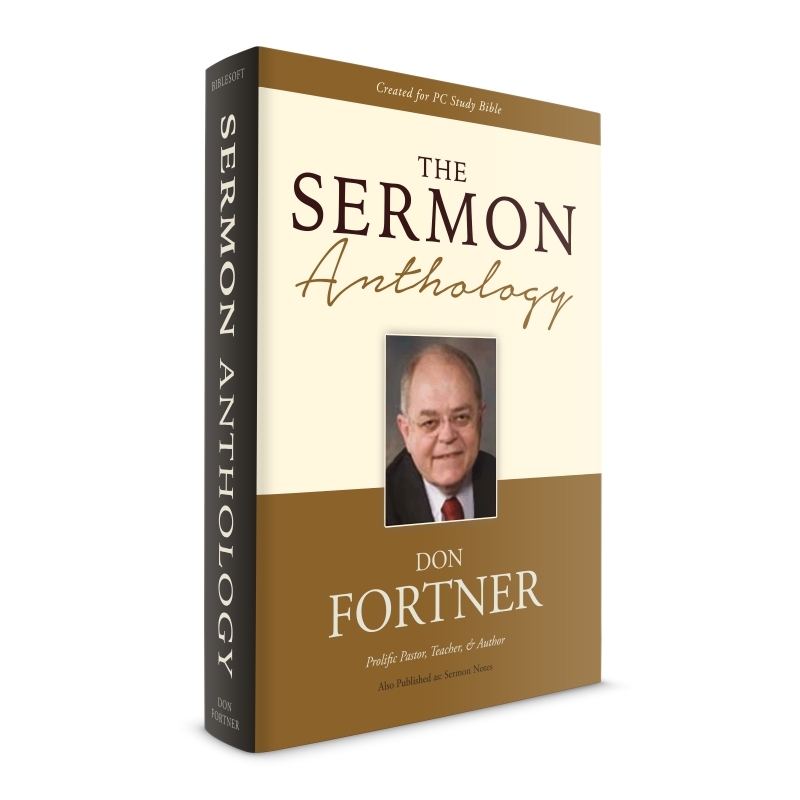 If you are a pastor looking for sermon ideas, you are sure to enjoy Fortner's massive Sermon Anthology and will likely find yourself referencing this work regularly. "WHEN GOD BROKE HIS LONG SILENCE"
For four hundred years no one on earth had received any word from God. For four hundred years no prophet had been inspired to write a word of Inspiration. For four hundred years no angel had been sent from heaven to earth with a message from God to man. No revelation had been given, no vision had been granted. No word had come from God in four hundred years. Then, God spoke again! God chose one man and sent his angel to him with glad tidings from the throne of God. No one had heard from God since the days of the prophet Malachi. Then God spoke. Can you imagine what it must have been like to have been a man, faithful, devout, serving God in his appointed place, knowing that no one had heard from heaven in four hundred years, then, suddenly, to have an angel of the Lord to appear to you alone with a word of divine Revelation? That is what we have before us in our text tonight. Our text is Luke 1:5-12. The title of my message is this - WHEN GOD BROKE HIS LONG SILENCE. Luke 1:5-12 "There was in the days of Herod, the king of Judaea, a certain priest named Zacharias, of the course of Abia: and his wife was of the daughters of Aaron, and her name was Elisabeth. 6 And they were both righteous before God, walking in all the commandments and ordinances of the Lord blameless. 7 And they had no child, because that Elisabeth was barren, and they both were now well stricken in years. 8 And it came to pass, that while he executed the priest's office before God in the order of his course, 9According to the custom of the priest's office, his lot was to burn incense when he went into the temple of the Lord. 10 And the whole multitude of the people were praying without at the time of incense. 11 And there appeared unto him an angel of the Lord standing on the right side of the altar of incense. 12 And when Zacharias saw him, he was troubled, and fear fell upon him." The first thing recorded in Luke’s gospel is the appearance an angel to one of the ordinary priests in Israel, named Zecharias. The angel announced to this old man that his wife, who was an old woman, well past the age of child-bearing, was, by direct, divine intervention, going to have a son, and that his son would be the forerunner of the long-awaited Messiah. What a great word of grace! It was too good for this old man to believe. Being a faithful man, Zecharias knew that God had promised four hundred years before this that when Messiah came some man, in the spirit and power of Elijah would go before him to prepare his way before the people (Mal. 3:1). Malachi 3:1 "Behold, I will send my messenger, and he shall prepare the way before me: and the Lord, whom ye seek, shall suddenly come to his temple, even the messenger of the covenant, whom ye delight in: behold, he shall come, saith the LORD of hosts." It is, I am sure, impossible for us 2000 years later to grasp what an astounding thing this was. God made the promise four hundred years earlier. Then the heavens were silent. Not another Word was given. Then, suddenly, without any preparatory work, God sent his angel to a certain old man that Daniel’s prophetic weeks were about to be fulfilled. Messiah, the Prince” was about to be revealed (Dan. 9:25). That “seed” of Abraham, in whom all the nations of the earth would be blessed, was about to come (Gen. 22:18). “The Desire of all nations” who would fill the house of God with glory would soon be revealed from heaven (Hag. 2:7).